ANAHEIM , California. 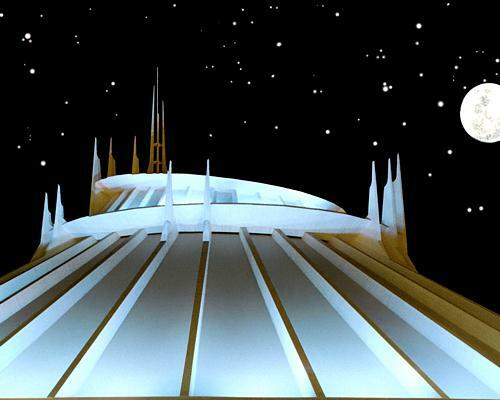 , May 5, 2004 ” On May 27, 1977 , the U.S. Mercury Astronauts (the first men in space) took the first official flight on ” Space Mountain ” during its grand opening festivities. Almost instantly the state-of-the-art thrill attraction garnered a reputation for fun and excitement thus becoming one of the most perennially popular attractions at Disneyland park. Now as Disneyland prepares to commemorate its milestone 50th anniversary with “The Happiest Homecoming on Earth” celebration, the landmark Tomorrowland attraction and icon will undergo a major transformation, ensuring that it remains one of the most famous, exciting and cutting-edge Disney theme park adventures of all-time. Already the exterior futuristic spires and slopes of ” Space Mountain ” have been restored to their familiar gleaming white color while the attraction”s interior is being completely revamped. The boarding area will feature a new hi-tech launch port and an updated vehicle probe. Guests will feel as if they have a first-hand look into space, as a space station rotates around the earth. After launching through a disorienting tunnel, riders will have a close encounter with a large meteorite. “We call it our “surprise in the sky,”” added Braverman. The remainder of the pulse-racing adventure will be filled with billions of stars racing by and an all-new edgy, heart-pounding instrumental sound track before guests experience an entirely new finale featuring a longer re-entry tunnel filled with spectacular lighting effects. The initial concept for ” Space Mountain ” originated with Walt Disney himself back in the early 1960s and was known simply as ” Space Port. ” The concept became a reality in 1975 when the first incarnation of ” Space Mountain ” premiered in the Magic Kingdom Park at Walt Disney World Resort in Florida . After 12 years of planning and over one million man-hours in design and construction, ” Space Mountain ” made its Southern California premiere in Tomorrowland at Disneyland in 1977 to eager would-be space travelers. Premiering on May 5, 2005 “The Happiest Homecoming on Earth,” an extraordinary celebration of the golden 50th anniversary of Disneyland, will pay tribute to the millions of guests and Cast Members who have contributed to the rich legacy of “The Happiest Place on Earth” over the past five decades. The 18-month long occasion represents the biggest celebration in the history of Disney theme parks and is the first truly global Disney event (with commemorative events planned at each of the Disney theme parks around the world in salute to Disneyland ).